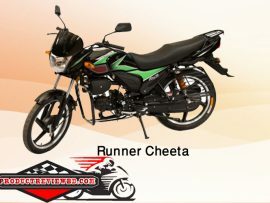 Get all the latest runner Bikes price. Runner Deluxe is a product of Runner. This bike is powered by 85cc engine which generates Maximum power 4.8Kw/7500 rpm and its maximum torque is 5.7 N.m/6000 rpm. Runner Deluxe can runs 80 KM per hour and it burns fuel 60 KM per Liter (approx).Max power is 4.8Kw/7500 rpm and the max torque is 5.7 N.m/6000 rpm. Max speed of this bike/Engine >80Km/h. This bike has both system in starting, Electric and kick. Ignition type is CDI. Clutch is Wet multi-plate type. 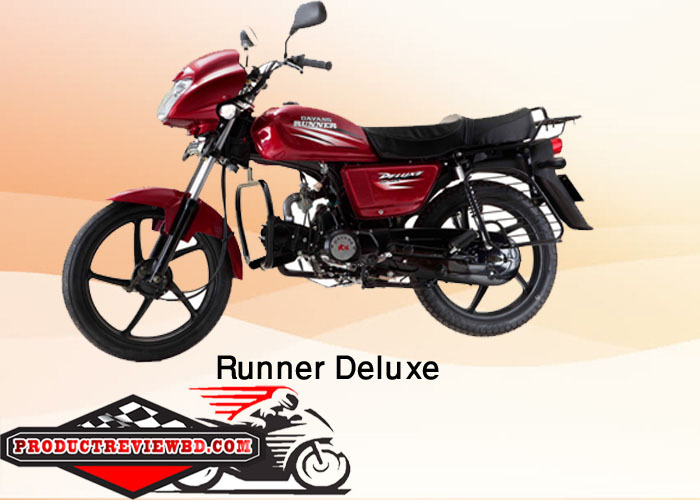 Runner Deluxe Motorcycle Bangladesh 2017 price is 83,000.00 BDT. Runner Duranto has a body dimension of L+W+H= 1869x835x1180. Fuel tank capacity is 7.5 Liter. Two adult person can easily sit and 3 person with a baby also can sit on it. This bike also possess a strong carrier by which anyone can carry goods by it if necessary. The displacement of the Engine is 82.9cc. Engine type is Single Cylinder, Four Stroke, Air Cooled, Petrol Engine. Max power is 4.0kw @7500 rpm. This Engine is Air cooled, kick starting, CDI ignition type with 4 gears. Its mileage is 55 – 65 KMPL. 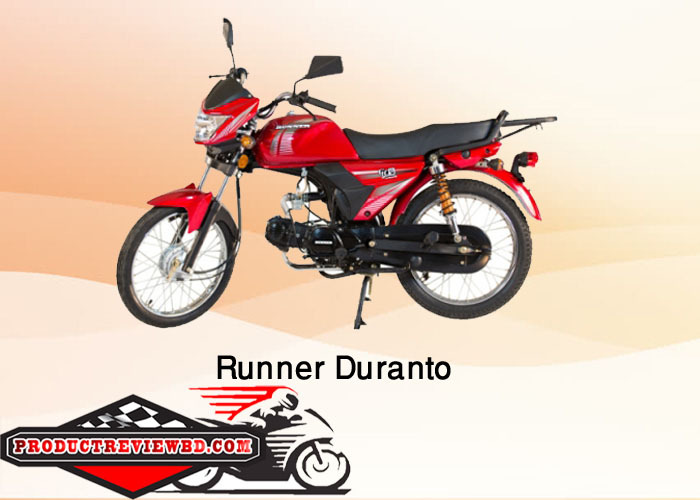 Runner Duranto Motorcycle Bangladesh 2017 price is 59,000.00 BDT. 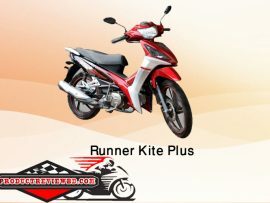 Runner Kite+ is a product of Runner. This bike is powered by 110 engine which generates Maximum power and its maximum torque is . Runner Kite+ can runs KM per hour and it burns fuel KM per Liter (approx). Runner Kite+ Motorcycle Bangladesh 2017 price is 86,000.00 BDT. 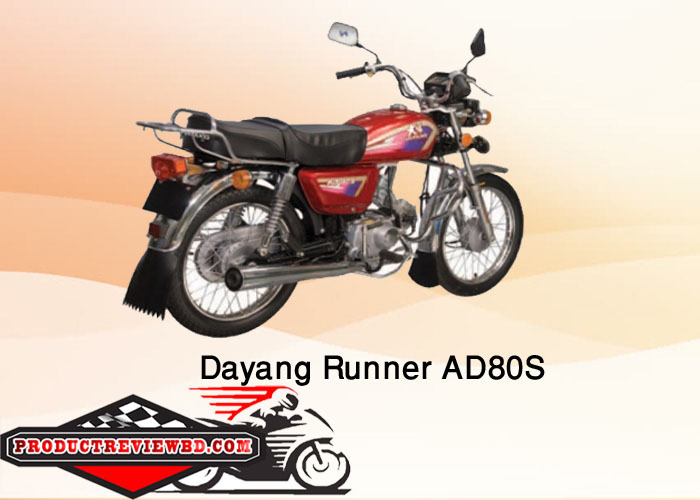 Dayang Runner AD80S is a product of Runner. This bike is powered by 79cc engine which generates Maximum power 4.8Kw/7500 rpm and its maximum torque is 5.7 N.m/6000 rpm. Dayang Runner AD80S can runs 80 KM per hour and it burns fuel 65 KM per Liter (approx). 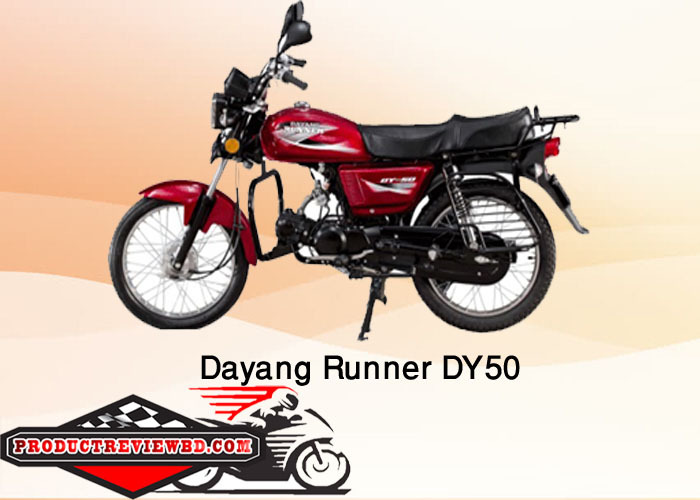 Dayang Runner DY50 is a product of Runner. This bike is powered by 49 engine which generates Maximum power 3.8Kw/8500 rpm and its maximum torque is 4.8 N.m/6500 rpm. Dayang Runner DY50 can runs 70 KM per hour and it burns fuel 70 KM per Liter (approx). Runner F100-6A is a product of Runner. This bike is powered by 100 engine which generates Maximum power 5.2 Kw/8000rpm. Runner F100-6A can runs 80 KM per hour and it burns fuel 60 KM per Liter (approx). Runner F100-6A Motorcycle Bangladesh 2017 price is 88,000.00 BDT. 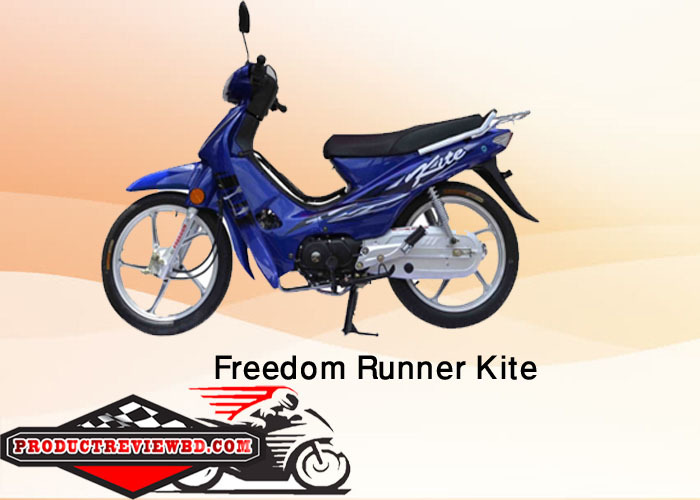 Freedom Runner Kite is a product of Runner. This bike is powered by 98.16 engine which generates Maximum power 4.8 Kw/7500rpm and its maximum torque is 7.0/5500 Nm/rpm. Freedom Runner Kite can runs 70 KM per hour and it burns fuel 60 KM per Liter (approx). 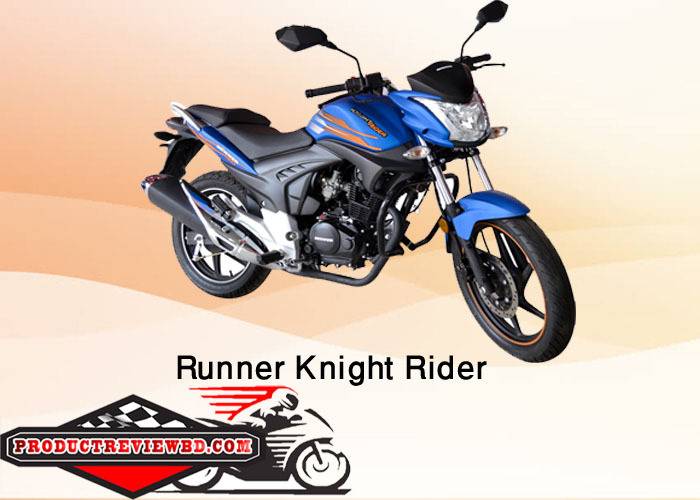 Runner Knight Rider is a product of Runner. This bike is powered by 150 engine which generates Maximum power 11.926Bhp @ 7500rpm and its maximum torque is 12.2Nm @ 5500rpm. Runner Knight Rider can runs 120 KM per hour and it burns fuel 50 KM per Liter (approx). 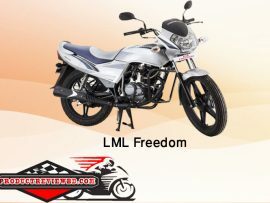 LML Freedom bike is L+W+H= 2010x725x820. 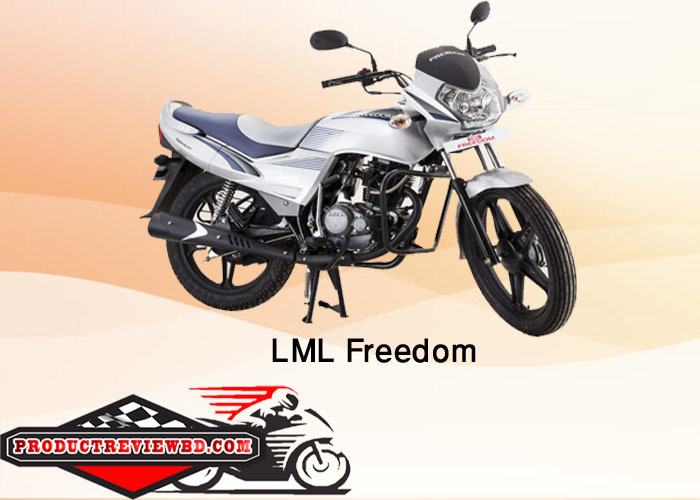 LML Freedom is a huge specious bike in which 3 passenger can sit comfortably. Very comfortable on the road as its front suspension is Telescopic and Rear suspension is Swing Arm. Also both wheels 18” Alloy. LML Freedom bike has a standard weight 119KG.This bike is powered by 110 engine which generates Maximum power and its maximum torque is . LML Freedom can runs 100 KM per hour and it burns fuel KM per Liter (approx). LML Freedom Motorcycle Bangladesh 2017 price is 1,25,000.00 BDT. 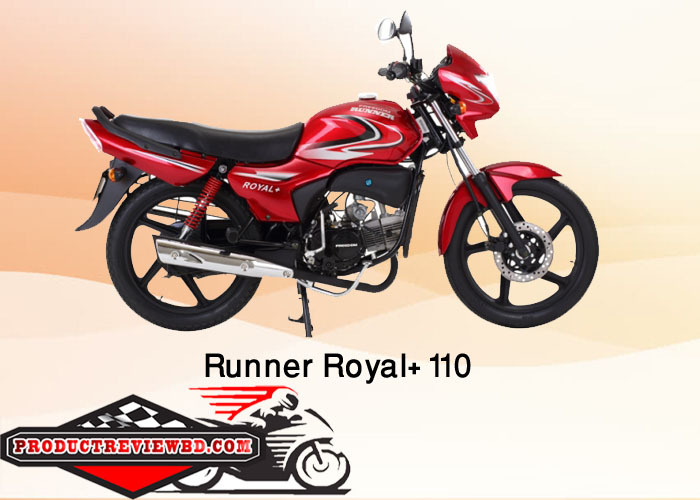 Runner Royal+ 110 bike has a nice and gorgeous out look that can make crazy any one. The dimension of this bike is (LxWxH)=2025 X 785 X 1235. Spacious in which 3 adult people and a baby can easily sit on it. Front wheel possess disc brake and rear wheel has the drum brake. Both wheels are in the Alloy. Tyre Front is 2.75-18 and the tyre rear is 3.00 – 18. This bike is powered by 109.1 engine which generates Maximum power 6.0 kw @ 7500 rpm and its maximum torque is 7.8 N.m @ 6000 rpm. Runner Royal+ 110 can runs 85 KM per hour and it burns fuel 55 KM per Liter (approx). As a 125cc motorcycle Mileage of Turbo 125 near about 55 KM/L (Approx). 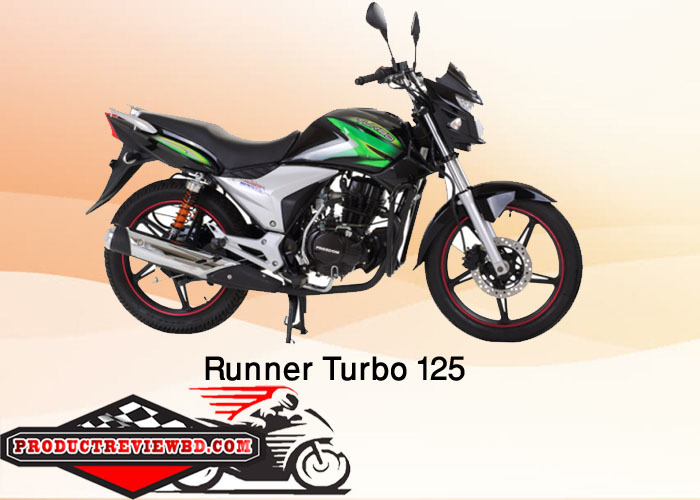 At the top speed this stylish bike is not so bad at all; it will give about 110 KM/H top speed for the riders.At the tyres Runner has used good quality tyres for Turbo 125 and their measurements are 2.75-18 at the front and 90/90-18 at the rear side. 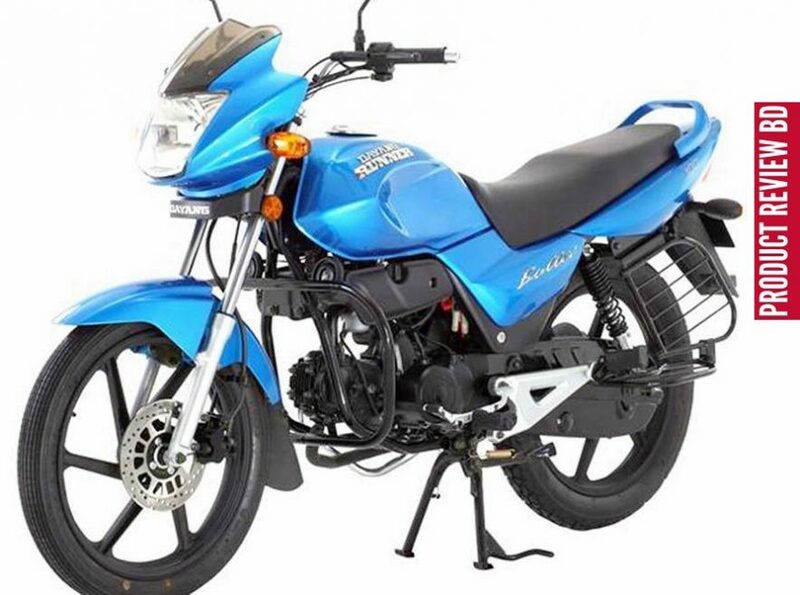 At the electrical side this bike contains excellent features, such as at the 12V 7Ah battery, at the head lamp it has 12V 35W/35W 3W; at the tail lamp it has 12V 21/5W, Digital speedometer and good quality turn light also. 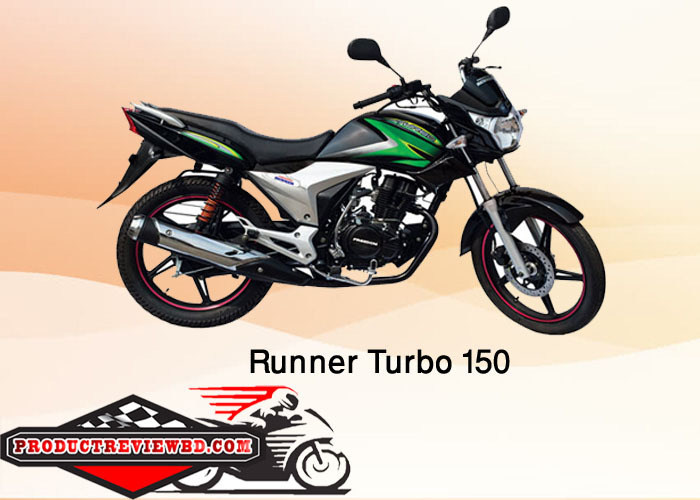 Runner turbo 150 look like sport bike. Dimension of this bike is (LxWxH)=2020 X 840 X 1240. Nice spacious in which 3 person can easily sit on it. Brakes of this bike is, front disk and rear is drum, no question about control, you will get enough to control the bike. Both wheels are in Alloy. Front wheel is 2.75-8, and rear wheel 90×90-18. Whole the bike is look just awesome on the outlook. You can not but you have to be a fun of this bike. This bike is powered by 148.2cc engine which generates Maximum power 8.5 KW @ 7300 RPM and its maximum torque is 11.5 N.m at 5500 rpm. Runner Turbo 150 can runs 110 KM per hour and it burns fuel 45 KM per Liter (approx). Type of the engine of this bike is Single Cylinder, Four Stroke, Air Cooled, Petrol Engine. Its displacement is 100cc. Max power is 5.2 Kw/8000rpm and max torque 6.5N.m/6500 rpm. It has 4 gears, kick and electric starting method, CDI ignition type and clutch is wet type. The mileage of this Engine, on the other hand this bikes is 55-65 KMPL. This bike is powered by 100 engine which generates Maximum power 5.2 Kw/8000rpm and its maximum torque is 6.5N.m/6500 rpm. 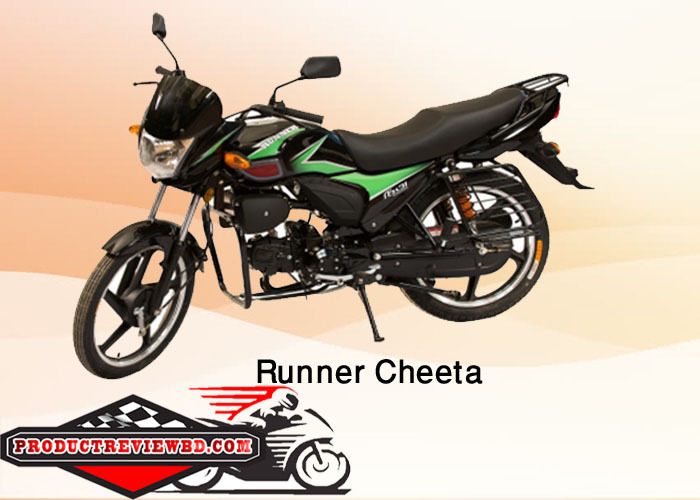 Runner Cheeta can runs 70 KM per hour and it burns fuel 60 KM per Liter (approx). Runner Bullet 100 bike is powered by 100.54 engine which generates Maximum power 4.8 kw @ 7500 rpm and its maximum torque is 7 N.m @ 5500 rpm. Runner Bullet 100 can runs 100 KM per hour and it burns fuel 50 KM per Liter (approx). 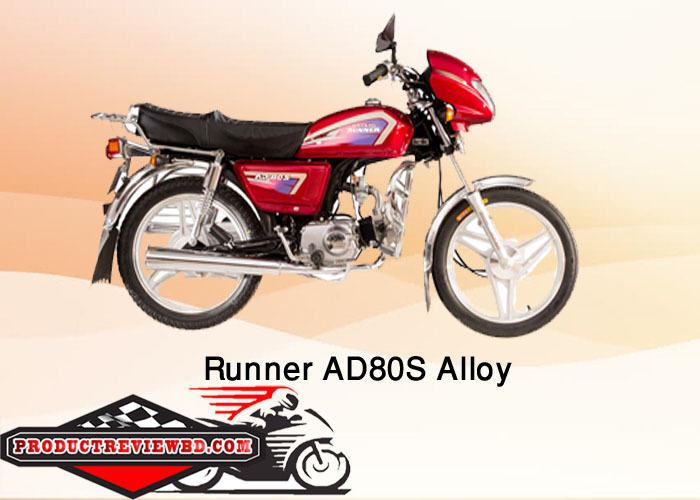 Runner AD80S Alloy has a gorgeous outlook that anyone cannot help but to be impress on it. This bike has a nice strong body in which three person can easily sit, along with 1 baby in the fuel tank. The dimension of the bike is (LxWxH)=1875 x 760 x 1010. his bikes engine type is 4-stroke, single cylinder. Displacement is 79cc, Max Power of this bike is 4.8Kw/7500 rpm and max torque is 5.7 N.m/6000 rpm. At the same time Max Speed (KM/H) >80Km/h. This engine has Air cooling system. Starting method is both electric and kick. Ignition type is CDI and it has 4 gears. 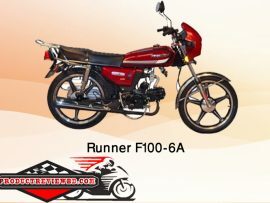 Runner AD80S Alloy Motorcycle Bangladesh 2017 price is 81,000.00 BDT.